Gathered clippers, an Armstrong Cheese Box, two small zinc flower pots and a few cuttings from the old boxwood shrub beside my deck. I saw a photo on The Cedar Shake Cape (boxwood in a plant pot, zinc pot with a burlap flower) that gave me the idea to cut some boxwood, bring my zinc plant pots inside, used an Armstrong cheese box for a tray (found in my Dad's shed when I was cleaning it out Friday) and a rooster and hen green salt and pepper (from my Mom's collection). Small treasures. I also tried a quick bit of February Greenery for the black magazine table. I dry-potted the boxwood. My boxwood Christmas wreath still holds its colour so I didn't worry about the boxwood branches in the pots. and used one bunch of boxwood in a vignette in my small portable lightbox. That is so pretty, Joy...and how great you could cut the boxwood in your own yard! Oh, styled so pretty! Makes me want to get in there and start moving things. 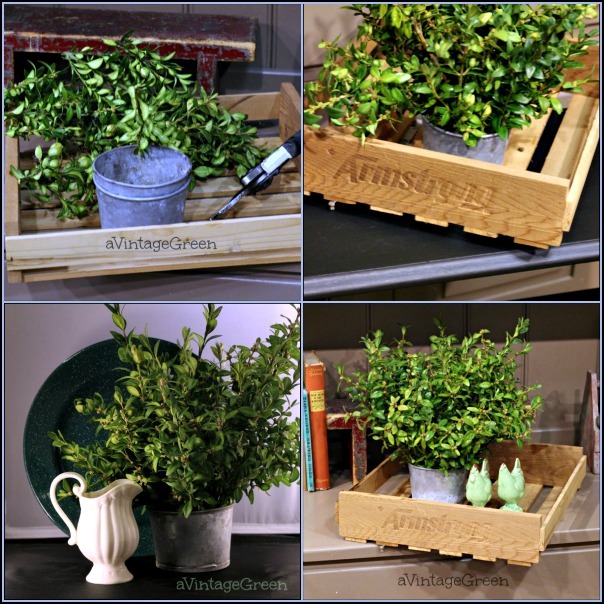 Don't you just love boxwood? It just perks everything up. 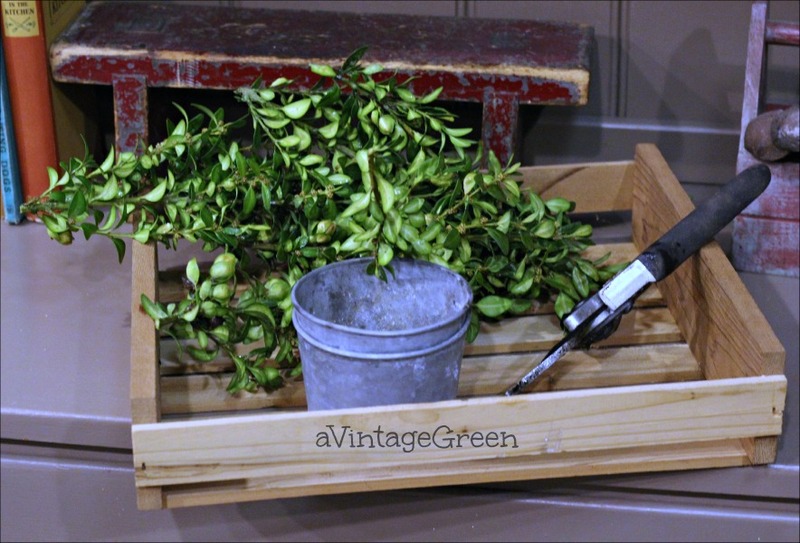 Lovely ... when we had our house we had boxwood on either side of the front door. Loved it. 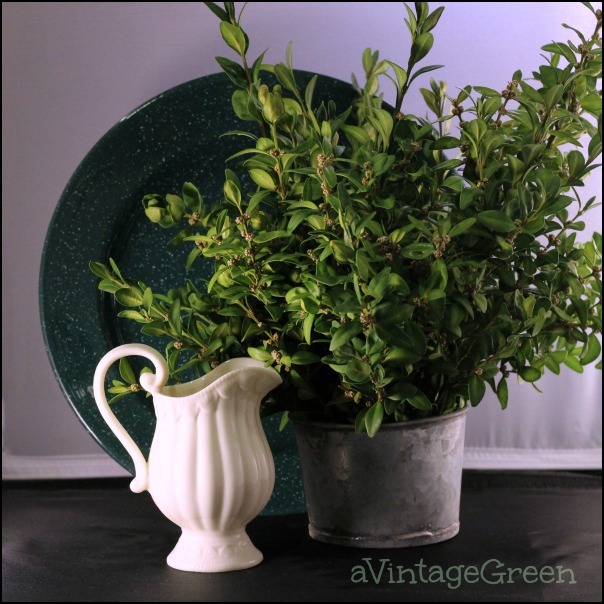 A versatile pot of boxwood branches for a touch of green, accompanied by the green rooster and hen. Did you put the branches in oasis or just water Joy? All are very pretty arrangements--they bring a bit of spring into the home! A very charming vignette, Joy. Even though it may be bitter cold outside, having some pretty greenery inside, makes if feel like spring. You created spots of beauty! Thanks. You found wonderful treasures and I loved seeing this today. What a beautiful arrangement you created. Amazing Thank you for sharing and I hope you will visit me soon. 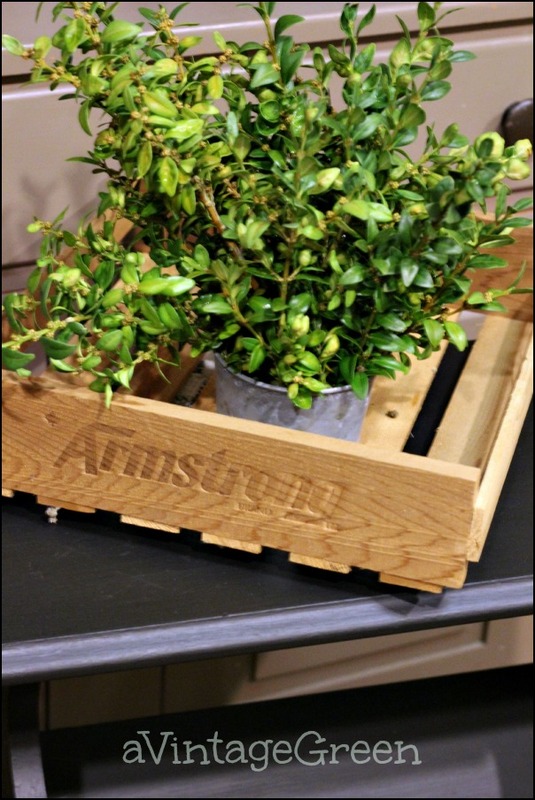 Love your boxwood in a box! Love the collage, cute vignettes! What a pretty idea. 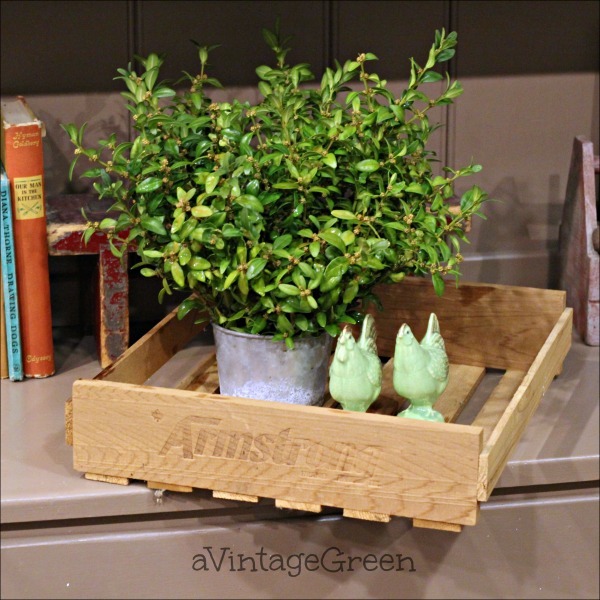 Boxwood, zinc and a wooden crate blend together beautifully in these vignettes. Love your idea of adding a little life to a room with outdoor greenery. great ideas and beautiful images!! i love having fresh anything in the house!!! Great inspiration Joy! I worked in the garden today and my boxwood is all pretty and green. Usually quite yellow at this time of year. I have two of those exact pots. May need to bring some inside. Can I just tell you that I am drooling over the S&P shakers. Love that shade of green! Love the greenery with the zinc pots. And to think I pruned last week and did not save even one twig. This looks so pretty, Joy! The greenery is perfect is your lovely pot :) Thank you so much for sharing at Roses of Inspiration. Hugs to you! Boxwood is one of my favorites in the garden. The color is beautiful and I especially love it with your zinc pots. So pretty! Always fun bringing things in from the garden. So fresh and pretty Joy! I love boxwood! From Trash 2 Treasure, I love this! I will have to go snip my boxwoods and see how longs it lasts! What a pretty, and inexpensive vignette! Thanks so much for sharing it at the Vintage Inspiration Party, Joy!